This is one of my favorite books of all time. 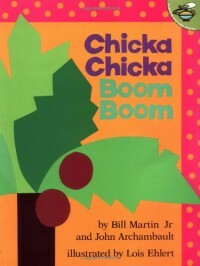 "Chicka Chicka Boom Boom will there be enough room"?! If you have kids of your own or are a teacher, you will have these words ingrained into my brain and you won't even mind. Letter Recognition (upper & lower) and rhyme make this book an educational gold mind. I personally use this book numerous times during the school year with a plethora of activities for letter recognition and then phonemic awareness. The children love watching the letters climb the tree, the letters come crashing down and the families coming to save the day. The bright colors are great as children are tempted to point to each letter as you read. I highly recommend this to parents and teachers alike.